The Predator is a boot which has previously set standards and carved a legacy within the footballing world, at the forefront of innovation and tech, it's time for a new chapter with the adidas Predator 19.1 FG Kids Football Boots. 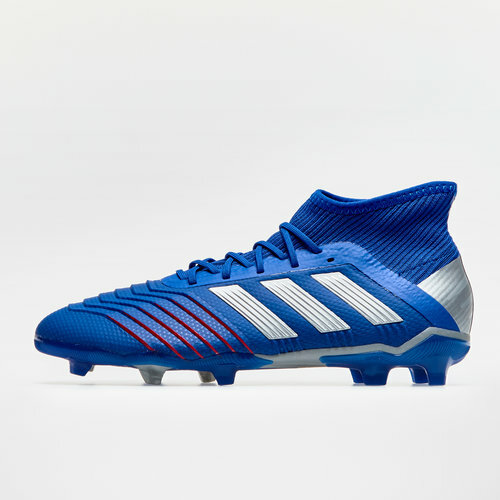 These adidas Predator 19.1 feature a Bold Blue, Silver Metallic and Football Blue colourway. The Predator is part of the Exhibit pack where no fakers are allowed but creators only. The adidas Exhibit pack introduces vibrant new colourways for the Copa, Predator, X and Nemeziz representing different types of creativity. This time around, no Nemeziz Messi is part of the pack. These boots are set to make creators out of anyone with the skills to back up the flamboyant look. With these boots it’s time for you to become the main attraction, it’s your show, it’s your time to dominate the pitch with your skills and results. You’re the Exhibit, so there’s no time to be anonymous and hide in the crowd of players, take centre stage.